Johnny Stocks: SENSIO Update - Is 3D Really Dead? SENSIO is undervalued at current levels. At .45-.50 per share the market is putting zero value on the future growth potential of the company. Short-term price target is .97-1.32 per share with a medium term upside target of 3.60-5.40 per share. 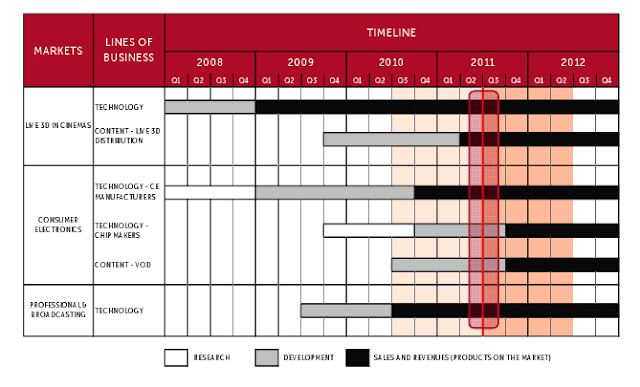 The 3D industry is currently in a transition period Moore refers to as "the chasm" (see Moore's chart below). 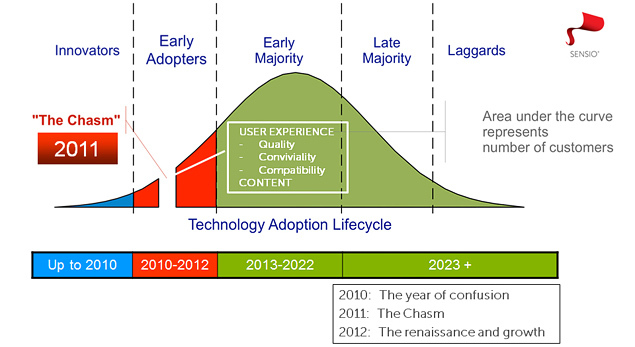 It is during this period that the industry must improve the user experience to move from the "early adopter" phase to the "early majority" phase. The existing cable/broadcasting infrastructure is built on 2D. Formats such as side-by-side or top/bottom work by putting both the left and right images on to a single frame - effectively halving the resolution. SENSIO Hi-Fi uses a propriety process that results in the final 3D image being virtually identical to the original. Consumers don't want to watch low res 3D. Sensio solves this problem by providing them with a HD 3D image identical to the original HD 2D image (i.e., ability to display virtually Blu-Ray quality). SENSIO has signed a licensing deals with Vizio to incorporate the SENSIO format in all of their 3DTVs. Most existing 3DTVs are unable to recognize the 3D format being transmitted (e.g., side-by-side, SENSIO Hi-Fi, etc). In order to watch the signal in 3D the user must navigate through a series of steps on their remote and manually choose the type of format. This can be so complicated that many 3DTV owners can't even figure out how to watch 3D on their 3DTVs (!!). Read a few 3D forums and you'll see what I mean. SENSIO Autodetect makes the process seamless by automatically identifying the type of signal being received, whether 2D or 3D, and automatically configuring the 3DTV to decode the signal and display the appropriate image. SENSIO Autodetect includes the ability to detect 2D screen menus overlayed on top of 3D images (e.g., DVR or PS3 menus). If you don't already own a 3DTV you probably would never think of this, but just using simple functions like pause or fast forward when watching 3D on most 3DTVs can result in a visual mess on the screen (for example, when the TV assumes your DVR menu is also in side-by-side mode and attempts to convert it to 3D). Good luck trying to access more advanced menu options. Addressing these "little things" can make a HUGE difference in user satisfaction. What if you bought a 3D disc or recorded a 3D program on your DVR but want to watch it in 2D? What if you have more friends over than you have 3D glasses? What if you want to switch to 2D while you are preoccupied with something else? What if you just want to take a break from 3D for a few minutes? SENSIO S2D Switch solves all of these issues by allowing the user to switch ANY 3D signal or 3D content to a 2D image with the press of a button. SENSIO's answer to the current lack of 3D content. Announced partnership with RoxioNow earlier this year. One of the largest libraries of 3D content in the world. All Vizio 3DTVs have or will have access to this content. As other manufacturers sign on to SENSIO format they will gain access to this content. Additional opportunities to re-broadcast or simulcast Live3D events. A year or two ago the 3D hype was at extreme levels following the success of movies like Avatar and the launch of the first 3DTVs. And this extreme bullishness saw SENSIO's shares trade from 40 cents to over 4 bucks in a matter of just a few months. Now, in 2011, the pendulum has swung fully in the other direction, with numerous headlines last month actually declaring 3D dead. This extreme negativity has helped push the share price back to pre-2010 levels. The fact that the company is significantly stronger than it was in 2009 is being ignored by the market right now. The market is pricing SENSIO shares as if the 3D industry is truly dead and as if SENSIO will never sign another deal in its lifetime. To invest in SENSIO you have to believe that 3D is here to stay. I firmly believe that. The studios, electronics manufacturers and cinemas have all invested a lot of money in 3D. The technology is much better than it was years ago. 3D gaming is just starting to show potential. And consumers seem to prefer the new passive 3DTVs recently launched by Vizio and LG over the original active 3DTVs still being pushed by Samsung and Sony. The passive 3DTVs use the cheaper/lighter glasses most theaters use (which don't require recharging) and don't suffer from some of the reported flicker and ghosting issues that many active 3DTVs do. Management still owns 20% of the company, and if industry fundamentals had truly taken a turn for the worse you can bet they would have been the first ones looking to lock in their gains. The fact they didn't do this is encouraging and tells me that management is still confident in the future of the 3D industry and in the future of SENSIO. In fact the only management transactions in the stock this year have been PURCHASES. Management and the board have recently purchased about 130,000 shares at an average price of around .50. Year-to-date revenues (Jun10-Feb11) are about $1.2 million, up about 177% vs. the year-ago period. The bulk of the $1.2 million in year-to-date revenues were driven by 3D live events. These revenues can be expected to show modest gains in the future as more and more cinemas license SENSIO technology. To date SENSIO is in over 800 theaters worldwide and growing. The biggest driver of increased revenues in the near-term should come from Vizio 3DTV sales. It took a long time coming, but Vizio just launched their new passive 3DTVs in May of this year. Starting in fiscal Q4 (Mar11-May11) we should begin to see the initial impact of these sales (Q4 earnings should be released later this month). Q1 (Jun11-Aug11) will be the first full quarter to benefit from the Vizio sales. In addition, Vizio just announced this past week a number of new lines of 3DTVs that will be launched this fall. The initial launch in May included just the 37-inch, 42-inch and 47-inch models. Between now and the end of the year Vizio is launching a number of new models which include sizes up to 65-inches. Every one of these Vizio 3DTVs are embedded with SENSIO technology and SENSIO receives a licensing fee for every 3DTV Vizio sells. SENSIO's balance sheet is strong, with no debt and $7.2 million in cash (about $0.13/share). Given the current burn rate of about $250k/month the company has enough liquidity on hand to fund current operations for over two years before having to worry about issuing additional shares. However in an interview just this past month SENSIO's CFO was quoted as saying it is probable the company will be cash flow positive by the end of next year. So it is likely the only reason the company would need to issue additional shares would be to fund additional acquisitions or growth opportunities. History Note: The company made a great move going to the market in late 2009 when they raised about $10 million in a bought deal at a price of $2.60 per share. 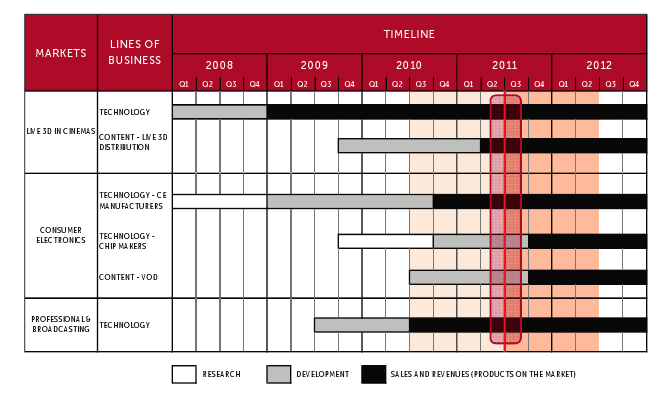 As stated above, the company was well aware of the expected "chasm" coming in 2010/2011. They were forward thinking enough to go to the market at a time when expectations and sentiment for the industry were high. As a result, they now have more than enough liquidity to get them through this chasm as the industry prepares to enter its "early majority" phase. Revenues for the first 9-months of the fiscal year were $1.2 million, with expectations for the full year to come in around $1.5-1.7 million. This initial valuation is based on existing revenues only. That is, if SENSIO were only a Live 3D events company, then you could argue that a fair valuation might be around 30 cents or so (not much below where we are now). But that would be ignoring all of their other business lines that are just starting to, or will soon start to generate revenues. And many of these businesses have the potential to generate significantly more revenues than the Live 3D business. Going forward, Vizio should start to contribute significantly to revenues. Vizio is currently the largest manufacturer of LCD TVs in North America, with a 21.4% market share vs. #2 Samsung at 16.6% (Sony is way behind at only 8.3%). Current expectations are for 18.8 million 3DTVs to be sold in 2011 and 36.4 million in 2012. Assuming Vizio can capture a 20% market share that would equate to sales of 7.3 million units in 2012. Assuming licensing revenues of $.50/unit sold would add $3.6 million to SENSIO's revenues in 2012. Assuming a ZERO increase in existing revenues and ZERO revenues from all of the new business lines mentioned above (conservative!) results in full year revenues of $5.1-5.3 million in 2012. Valuing these revenues at 5-7x results in company valuation of .62-.84 a share after adding back the cash. I use this .62-.84 / share valuation as my worst case scenario for SENSIO since it includes only existing revenues plus expected Vizio sales. To come up with a more realistic valuation I should add the expected NPV of the new business lines, such as VOD, and assume a reasonable growth factor for existing business lines. In addition, in my worst case scenario I assume no additional licensing agreements with major TV manufacturers or set-top box manufacturers. Signing a LG and/or a Samsung could add as much as the equivalent of the Vizio impact (i.e., another .35-.48 / share). Just adding this to the worst case scenario would suggest a valuation of .97-1.32 / share. This represents my base case scenario. Recent comments by senior management suggest that ongoing discussions with 1-2 TV manufacturers are going well. I expect to hear news of a new deal within the next couple months, if not sooner. If SENSIO succeeds in becoming the de-facto 3D format standard then all of the above assumptions are way too conservative. I haven't done enough analysis to properly assess the upside potential in the share price if SENSIO is successful in becoming the 3D standard so I won't try to value such a scenario here. However about 1 billion display devices were sold worldwide in 2010. Assuming SENSIO was able to achieve a 7.5% penetration rate, that would result in sales of 50 million SENSIO devices. At $.50/unit that gives us $25 million. At 5-7x revenues that would equal a valuation of 3.60-5.40 / share, ignoring all other revenue opportunities (existing and potential). This is obviously a very "ballpark" number but I think it conservatively represents the potential upside in the share price over the medium-term. Last month was a tough one for SENSIO shares. Heavy selling by a large institution that was long from the 2.60 private placement in 2009 was a big factor in slicing the share price in half, taking it from .85 down to .40. SENSIO is a relatively illiquid stock and dumping a million or more shares into the open market over a short period of time is not the smartest way to divest oneself of a position. That being said, the "panic selling" now appears to be over. Although I added to my long position at .53 and .43 on the way down, I wanted to wait until the floor was in place before writing another update on my blog. In 2009 the stock traded between .40-.75 for most of the spring/summer until it finally broke above .75 in August of that year. After breaking out it took just 2 weeks to hit 1.92, and then just another 3 months to hit 4.16. In 2010 the stock hit a low of .84 in the early summer and then more than doubled in price to 1.73 by mid-September. How much upside we see this time around will depend on how much new revenues, such as Vizio, impact the bottom line, as well as how successful SENSIO is in signing up new licenses over the next couple of months. 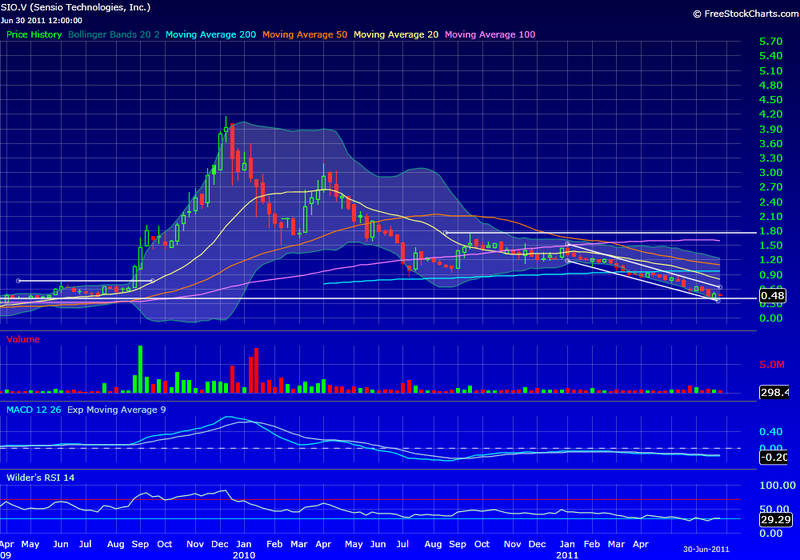 The stock has been in a clear down channel since the beginning of the year. I will be looking for a break above .60/.65 to confirm my view that the low has been put in place and that the next leg higher has begun. But with .13/share in cash the downside is limited. It won't take much in the way of good news to get us back above a buck by the end of the summer and then back to the top of the 1.75/1.80 range by the end of the year.